LOVE! Thank you for these swatches! I'm so excited to get my paws on them. The liners especially look BEAUTIFUL! I love the idea of brightening looks around the eyes! 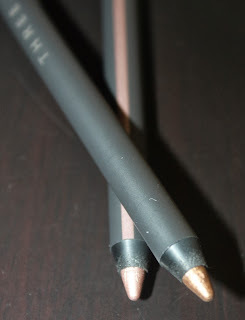 Maybe it would be good to tightline and then use these liners around the lashline to brighten, too. Such beautiful colors!! Oh, goodness…this looks amazing and it's very exciting that the bag is cute AND functional!!! Seriously this looks like one of the best sets I've seen lately!! Oops Gummy I missed this comment - I think I was in a packing frenzy:) Love this set - a good intro to Three!